Last night we carved Jane's first jack-o-lantern. Here is Jay cutting it open. Jane was dancing around in anticipation. Hmmm.... not quite what she expected. I did the carving. I have a lot of experience with this after 8 years of teaching kindergarten! Here is Jane with "Jack". That is what we decided his name was. For those of you who thought that was a possibility for our next little one... nope. Jane loved her little Jack! Especially after he was all lit up outside. I am a little late in posting about Jill turning nine months- woops! She is growing like a champ! 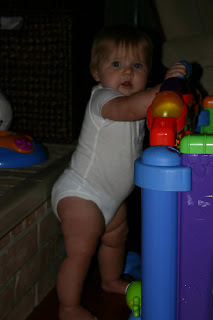 At her nine month appointment she had slimmed down to the 90th percentile at 21 1/2 lbs. and she is also in the 90th percentile for height at 29 inches. She is pointing and "talking" all of the time. Today, Jay says she said, "ouch". She has become quite the clown. Once she finds something that makes us laugh (like funny noises or faces) she does it again and again to get a reaction. She is a master crawler and she is pulling up and standing very steadily when holding on. She is "cruising" and loves to walk with you holding her hands. Some of her favorite things to do are playing with Jane (or watching Jane play). In this pic she was chasing Jane around in her walker and believe it or not she was trying to ram into her and Jane was running away pretend crying. See the "evil grin". And her favorite thing of all to do is eat! Jay and I reminisced how last year Jane struggled to get up this ladder and we had to stand on each side of it helping her up the whole way. What a difference a year makes! This is my friend Suzanne and her little girl Elise. This is Elise's brother Jake. Here is Elizabeth, my friend Laura's little girl. I love this pic of the all of the boys. They are: Jake, Josh, Cooper, Ben and Drew. Today we went over to my cousin Kerri's new house. Her and her husband, JD just moved to our area. Actually, they are like an hour away but we are SO happy because they HAD been living in Colorado the last couple of years. Now having them just a short trip away is awesome! Jane and Kylie (Kerri's 2 year old) always have such a great time together. Here are some pics from the day. Kylie: What are you doing? Jane: No, what are YOU doing? They dug out ALL of the toys from the toy chest. When asked what they were looking for, Jane answered "We don't know!" I am sure that was true. While we were there the candles Kerri had burning set off the fire alarm and I am only mentioning it because I think this picture is so funny! 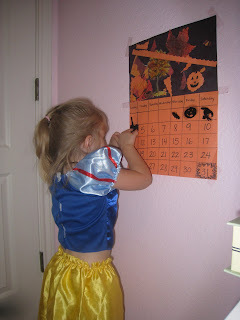 Jane has been asking about Halloween a lot, particularly WHEN is Halloween so I decided we should make a calendar and then she could add something to it each day to count down to Halloween. Here is a pic the third day we had it. Jane is adding these Halloween gummy shapes I happened to have a lot of. BTW the outfit is a leotard she got from her Aunt Kerri. This was taken minutes after she had changed from a "Fancy Nancy" outfit. Here is some from today. Can you tell my girl likes dressing up? This outfit is a Snow White dress she just got from my friend Nancy. Today we tried on the girls Halloween costumes just to be sure they fit. Here are some pics as the girls played around. Jane got this outfit from my parents. They brought it back for her from their vacation to Durango earlier this summer. Here is Jane petting her horse. 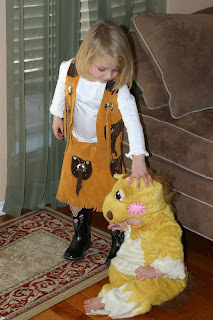 This horse costume Jane wore for Halloween one year too but it sure looks cuter next to a cowgirl.